Paul Virilio (4 January 1932 – 10 September 2018) was a French cultural theorist, urbanist, and aesthetic philosopher. He is best known for his writings about technology as it has developed in relation to speed and power, with diverse references to architecture, the arts, the city and the military. He is best known for his book Bunker Archeology (1975). Paul Virilio was born in Paris in 1932 to an Italian communist father and a Catholic Breton mother. He grew up in the northern coastal French region of Brittany. The Second World War made a big impression on him as the city of Nantes fell victim to the German Blitzkrieg, became a port for the German navy and was bombarded by British and American planes. The "war was his university". After training at the École des métiers d'art, Virilio specialised in stained-glass artwork, and worked alongside Henri Matisse in churches in Paris. In 1950, he converted to Christianity. After being conscripted into the army during the Algerian war of independence, Virilio attended lectures in phenomenology by Maurice Merleau-Ponty at the Sorbonne. In 1958, Virilio conducted a phenomenological inquiry into military space and the organization of territory, particularly concerning the Atlantic Wall—the 15,000 Nazi bunkers built during World War II along the coastline of France and designed to repel any Allied assault. In 1963 he began collaborating with the architect Claude Parent and formed the Architecture Principe group. (Among the small group of interns were the architects Francois Seigneur and Jean Nouvel.) After participating in the May 1968 uprising in Paris, Virilio was nominated Professor by the students at the École Spéciale d'Architecture. In 1973 he became Director of Studies. In the same year, Virilio became director of the magazine L'Espace Critique. In 1975 he co-organized the Bunker Archéologie exhibition at the Decorative Arts Museum in Paris, a collection of texts and images relating to the Atlantic Wall. Since then he has been widely published, translated and anthologised. Since 1998, Virilio was teaching intensive seminars at European Graduate School. His last projects involved working with homeless groups in Paris and building the first Museum of the Accident. According to geographers Tim Luke & Gearóid Ó Tuathail, Virilio was a "historian of warfare, technology and photography, a philosopher of architecture, military strategy and cinema, and a politically engaged provocative commentator on history, terrorism, mass media and human-machine relations." Virilio developed what he called the "war model" of the modern city and of human society in general and is the inventor of the term 'dromology', meaning the logic of speed that is the foundation of technological society. His major works include War and Cinema, Speed and Politics and The Information Bomb in which he argues, among many other things, that military projects and technologies drive history. Like some other cultural theorists, he rejects labels - including 'cultural theorist' - yet he has been linked by others with post-structuralism and postmodernism. Some people describe Virilio's work as being positioned in the realm of the 'hypermodern'. He has repeatedly affirmed his links with phenomenology, for example, and offers humanist critiques of modernist art movements such as Futurism. Throughout his books the political and theological themes of anarchism, pacifism and Catholicism reappear as central influences to his self-proclaimed 'marginal' approach to the question of technology. His work has been compared to that of Marshall McLuhan, Jean Baudrillard, Gilles Deleuze and Félix Guattari, Jean-François Lyotard, Jacques Ellul, and others. Virilio was also an urbanist. After having been a longtime resident of the city of Paris, he moved to La Rochelle. Virilio's predictions about 'logistics of perception' - the use of images and information in war - (in War and Cinema, 1984) were so accurate that during the Gulf War he was invited to discuss his ideas with French military officers. Virilio argued that it was a 'world war in miniature'. Virilio believed that technology cannot exist without the potential for accidents. 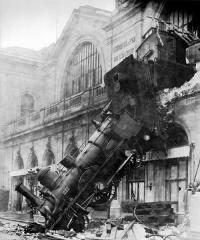 For example, Virilio argued that the invention of the locomotive also contained the invention of derailment. He saw the Accident as a rather negative growth of social positivism and scientific progress. He believed the growth of technology, namely television, separates us directly from the events of real space and real time. In it he suggested we lose wisdom and sight of our immediate horizon and resort to the indirect horizon of our dissimulated environment. From this angle, the Accident can be mentally pictured as a sort of "fractal meteorite" whose impact is prepared in the propitious darkness, a landscape of events concealing future collisions. Aristotle claimed that "there is no science of the accident", but Virilio disagreed, pointing to the growing credibility of simulators designed to escape the accident— which he argued is an industry that is born from the unholy marriage of post-WW2 science and the military-industrial complex. The first deterrence, nuclear deterrence, is presently being superseded by the second deterrence: a type of deterrence based on what I call 'the information bomb' associated with the new weaponry of information and communications technologies. Thus, in the very near future, and I stress this important point, it will no longer be war that is the continuation of politics by other means, it will be what I have dubbed 'the integral accident' that is the continuation of politics by other means. In contemporary warfare, logistics does not just imply the movement of personnel, tanks, fuel and so on, but also the movement of images both to and from the battlefield. Virilio talked a lot about the creation of CNN and the concept of the newshound. The newshound will capture images which will then be sent to CNN, which may then be broadcast to the public. This movement of images can start a conflict (Virilio uses the example of the events following the broadcasting of the Rodney King footage). The logistics of perception relates also to the televising of military maneuvers and the images of conflict that are watched not only by people at home, but also by the military personnel involved in the conflict. The 'field of battle' also exists as a 'field of perception'. For Virilio, the transition from feudalism to capitalism was driven not primarily by the politics of wealth and production techniques but by the mechanics of war. Virilio argued that the traditional feudal fortified city disappeared because of the increasing sophistication of weapons and possibilities for warfare. For Virilio, the concept of siege warfare became rather a war of movement. In Speed and Politics, he argues that 'history progresses at the speed of its weapons systems'. The writings of Paul Virilio revolve principally around the themes of technology, communication, and speed. They contain a plethora of references to physics, particularly the theory of relativity. Though Virilio’s sentences are slightly more meaningful than those of Deleuze-Guattari, what is presented as "science" is a mixture of monumental confusions and wild fantasies. Furthermore, his analogies between physics and social questions are the most arbitrary imaginable, when he does not simply become intoxicated with his own words. We confess our sympathy with many of Virilio’s political and social views; but the cause is not, alas, helped by his pseudo-physics. Here Virilio mixes up velocity (vitesse) and acceleration, the two basic concepts of kinematics (the description of motion), which are introduced and carefully distinguished at the beginning of every introductory physics course. Perhaps this confusion isn’t worth stressing; but for a purported specialist in the philosophy of speed, it is nonetheless a bit surprising. This paragraph — which in the French original is a single 193-word sentence, whose "poetry" is unfortunately not fully captured by the translation — is the most perfect example of diarrhea of the pen that we have ever encountered. And as far as we can see, it means precisely nothing. His scattergun writing style is not always easy to follow, often provoking disorientation and dislocation at the very least. Insights, personal memories, detailed histories, major theoretical leaps and banalities sit side by side. Reading Virilio thoroughly does leave the reader with the feeling of many dislocated, undeveloped ideas swirling around often at the level of great generality. The content is often not particularly logical if viewed from a conventional academic perspective in the human or social sciences. Paul Virilio’s writing have long had a major role in the theoretical socio-legal studies subdiscipline of law and popular culture which has operated at the intersection of critical legal studies and cultural studies for over two decades. Virilio is unlikely to be read in the 'mainstream' of academia (although one might find his works on the reading lists of a military academy). Virilio draws on and develops points that are made by many critical thinkers from (predominantly) the twentieth century (most notably Walter Benjamin), assembling ideas in new contexts, creating a vision of the world through concepts and language that is often unsettling, a (re)description that makes the world feel strange and unfamiliar. Virilio’s often alien-sounding concepts attempt to enable us to see the world anew, to view a world that is presented to us in terms of fear and progress as something alien (and alienating), to give a form to feelings and suspicions that remain vague, unclear, uncertain, out of place. There are a least two different instances of this quote: 1) "When you invent the ship, you also invent the shipwreck; when you invent the plane you also invent the plane crash; and when you invent electricity, you invent electrocution...Every technology carries its own negativity, which is invented at the same time as technical progress." (Politics of the Very Worst, New York: Semiotext(e), 1999, p. 89); 2) “To invent the sailing ship or the steamer is to invent the shipwreck. To invent the train is to invent the rail accident of derailment. To invent the family automobile is to produce the pile-up on the highway.” (The Original Accident, Cambridge: Polity, 2007, p. 10). War and Cinema: The Logistics of Perception. London: Verso, 1989. Popular Defense and Ecological Struggles. New York: Semiotext(e), 1990. The Aesthetics of Disappearance. New York: Semiotext(e), 1991. Lost Dimension. New York: Semiotext(e), 1991. Atom Egoyan. Paris: Dis Voir, 1994. The Vision Machine. Bloomington: Indiana University Press, 1994. Bunker Archaeology. New York: Princeton University Press, 1994. The Art of the Motor. Minneapolis: University of Minnesota Press, 1995. Open Sky. London: Verso, 1997. Pure War. New York: Semiotext(e), 1997. Politics of the Very Worst. New York: Semiotext(e), 1999. Polar Inertia. London: Sage, 1999. A Landscape of Events. Cambridge: MIT Press, 2000. The Information Bomb. London: Verso, 2000. Strategy of Deception. London: Verso, 2000. Virilio Live: Selected Interviews. Edited by John Armitage. London: Sage, 2001. Ground Zero. London: Verso, 2002. Desert Screen: War at the Speed of Light. London: Continuum, 2002. Crepuscular Dawn. New York: Semiotext(e), 2002. Unknown Quantity. New York: Thames & Hudson, 2003. City of Panic. Oxford: Berg, 2005. The Accident of Art. (with Sylvère Lotringer) New York: Semiotext(e), 2005. Negative Horizon: An Essay in Dromoscopy. London: Continuum, 2005. Art as Far as the Eye Can See. Oxford: Berg Publishers, 2007. Grey Ecology. New York/Dresden: Atropos Press, 2009. The University of Disaster. Cambridge: Polity, 2010. The Futurism of the Instant: Stop-Eject. Cambridge: Polity, 2010. A Winter's Journey : Four Conversations with Marianne Brausch. The French list. Seagull Books, 2011. The Administration of Fear. New York: Semiotext(e), 2012. Unless indicated otherwise, the text in this article is either based on Wikipedia article "Paul Virilio" or another language Wikipedia page thereof used under the terms of the GNU Free Documentation License; or on original research by Jahsonic and friends. See Art and Popular Culture's copyright notice. This page was last modified 21:15, 22 September 2018. This page has been accessed 14,472 times.